Gary Yee, a former board member and interim superintendent in Oakland Unified, was elected to the school board again this month. As new school board members across California prepare to take the seats they won in the election earlier this month, Oakland Unified’s only newly elected board member Gary Yee knows there will be no honeymoon. In January, he will join a board whose first challenge is finding $30 million in spending cuts in next year’s budget to stem the district’s deficit spending. Failing to do that could result in the county or state intervening. Decisions about those cuts must be made by February by the seven-member board, which will also include incumbents Aimee Eng and Shanthi Gonzales, who both ran unopposed in their districts and were re-elected on Nov. 6 to four-year terms. Yee stands apart from most new school board members because he’s no newcomer to education issues or district politics. Coaxed out of retirement to run for the board, Yee will bring more experience to the job than most. He’s served on the board in the past and has also been the district’s interim superintendent, a principal and a district teacher. But he doesn’t want to be perceived as a know-it-all. Instead of coming onto the board and shaking things up, Yee said he wants to contribute to the team. Being a school board member can be one of the most challenging elected offices to hold, since it requires balancing the needs and demands of multiple constituencies, including parents, teachers, staff and students. But in districts like Oakland, which is facing a cascading series of budget and other problems — from a possible teachers’ strike to the need to compete with charter schools for students while making massive budget cuts, including closing schools — board members must make choices that have a good chance of antagonizing constituencies and interest groups in the district. Yee’s prior service could give him an advantage, since he’s been there before. He said his primary area of interest and expertise is instruction. He’s also interested in providing high-quality schools and balancing charter schools with district schools. He said it will be important for the district to figure out how many quality district and charter schools each neighborhood needs, while also considering choice-based schools such as Dual Language Immersion schools, magnet schools such as Life Academy, which focuses on health and bioscience, and “preserving enough resources for teachers’ salaries.” The board is currently grappling with how to significantly increase teachers’ pay in the hopes of stemming the district’s high teacher turnover, as it works to negotiate a new contract with the Oakland Education Association union. Yee was elected with 59 percent of the votes in District 4, which includes 10 elementary and middle schools in the northern and eastern parts of the district. He beat Clarissa Doutherd, a nonprofit executive director backed by the California Teachers Association and local Oakland Education Association, who received 41 percent of votes. Eng’s District 2 in Central Oakland includes Oakland High and Gonzales’s District 6 in Northeast Oakland includes Skyline High. 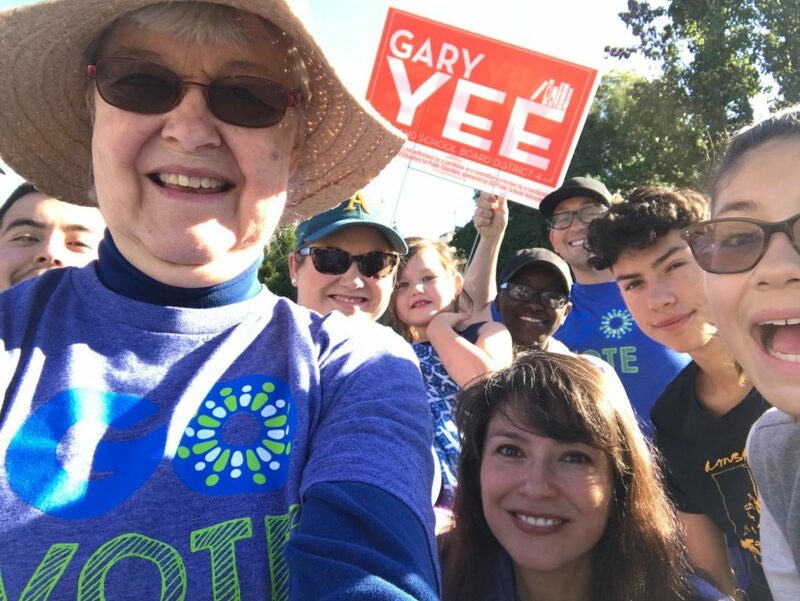 GO Public Schools Advocates, an independent expenditure committee, spent more than $100,000 to support Yee’s election. His campaign also got direct contributions from the building trades unions and an endorsement from the local Chamber of Commerce. Independent expenditure committees are allowed to receive donations of unlimited size, but are barred from coordinating their activities with candidates. Direct contributions from individuals and political action committees to campaigns are limited in Oakland. 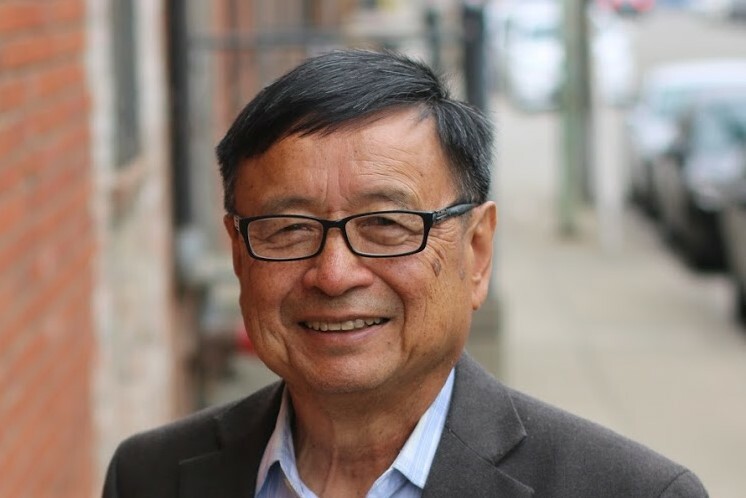 Yee credits his win to being well-known in the community, in part due to spearheading the successful Measure N parcel tax in 2014, which funds career-related “Linked Learning” programs and classes for district students. He also got to know a lot of people when he was an interim superintendent in 2013-14 and board member. The district is currently facing a fiscal crisis that has prompted the state to provide bailout funding over the next four years if the board follows through with making $30 million in cuts next year to balance its 582.3 million budget. The district is still paying back a $100 million loan it received from the state in 2003. The board has asked Superintendent Kyla Johnson-Trammell to cut staff, reorganize the district and recommend schools for consolidation or closure. If the district fails to make the cuts, county and state officials have warned they could step in and take control. GO Public Schools Oakland members express their support for Gary Yee before the Oakland school board election. GO Public Schools Oakland, which includes members who support both district-run schools and charter schools, has two main priorities or “campaigns” in Oakland: 1Oakland to ensure that schools — whether district or charter — are quality schools and Budgeting for Impact to improve the district’s fiscal practices. 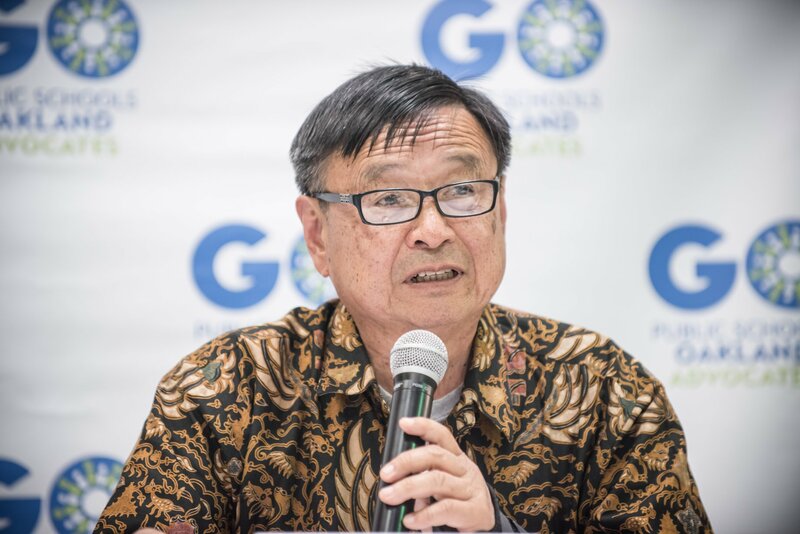 GO believes that Yee and Eng are aligned with their goals in both campaigns. But Stewart said while the group appreciates Gonzales’ leadership on the district’s Special Committee on Fiscal Vitality, GO has been “disappointed” that she voted against the district’s “Community of Schools” policy. It calls for a citywide plan that will review all district and charter schools in Oakland with a goal of reducing the total number of schools and ensuring those that remain are high quality. Gonzales voted against the plan after failing to get support for amendments that would have added more scrutiny to the district’s approval and renewal of charter schools regarding suspensions, expulsions and transfers, along with innovation and special education enrollment. Yee said he’s being careful not to weigh in too early on matters up for discussion before the board and instead plans to wait until he assumes his elected position in January. However, he said he hopes to ask good questions to make sure board members and staff consider the possible consequences of budget cuts or other actions. 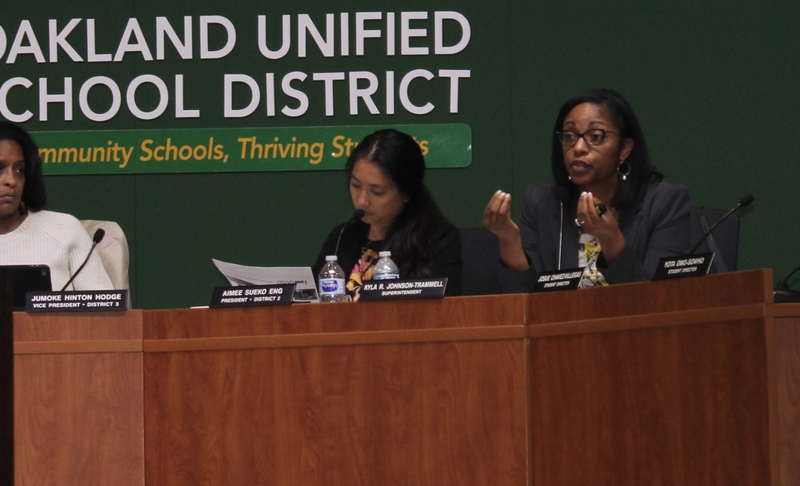 Oakland Unified Superintendent Kyla Johnson-Trammell explains the district’s plans to close or consolidate schools at the Nov. 14, 2018 school board meeting. He also said he’s very supportive of Johnson-Trammell, who was the assistant superintendent of curriculum and professional development when he was interim superintendent. 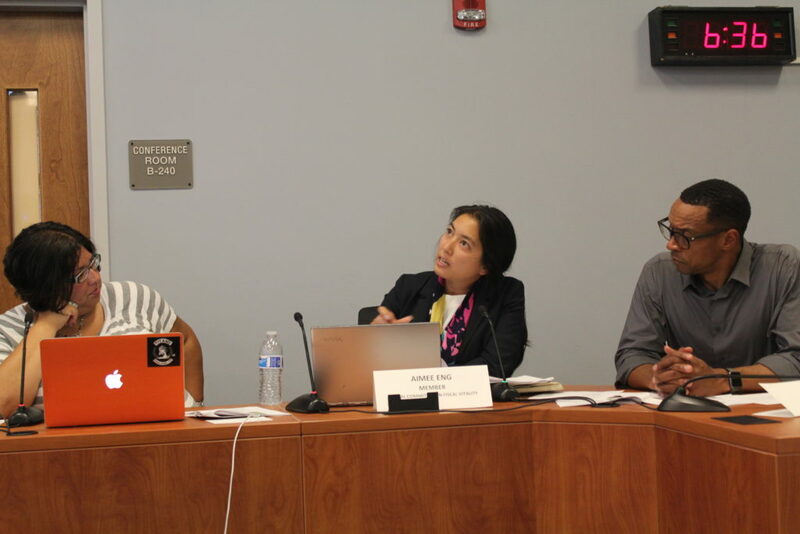 Oakland Unified school board members (left to right) Shanthi Gonzales, Aimee Eng and James Harris discuss budget cuts during a Special Committee on Fiscal Vitality meeting. Redesign the district by eliminating programs and initiatives that aren’t helping students and reduce the number of district schools. Consult with constituents before making final decisions. In February, the board will consider closing or consolidating schools. The district has 24 more schools than it will need in five years to educate the students it expects to enroll, according to a presentation by Johnson-Trammell and her staff. Editor’s Note: As a special project, EdSource is tracking developments this year in the Oakland Unified and West Contra Costa Unified School Districts as a way to illustrate some of the most urgent challenges facing many urban districts in California. West Contra Costa Unified includes Richmond, El Cerrito and several other East Bay communities. And, the process of closing 24 schools will upset X amount of parents who will seek an alternative to the privately managed charter school growth destabilizing the OUSD public school system. Some of the 24 closed schools will become former OUSD public schools managed by private managers of charter schools occupying the closed schools that are earthquake safe, built for education and where rent is charged below market rate. The flight from closed public schools starts with just hearing of possibility of being one of the 24 closed schools. The announcement is motivating another cycle of enrollment decline. Superintendent Johnson-Trammell and her staff will look ahead 5 more years and see that the structural enrollment decline calls for more school closures. 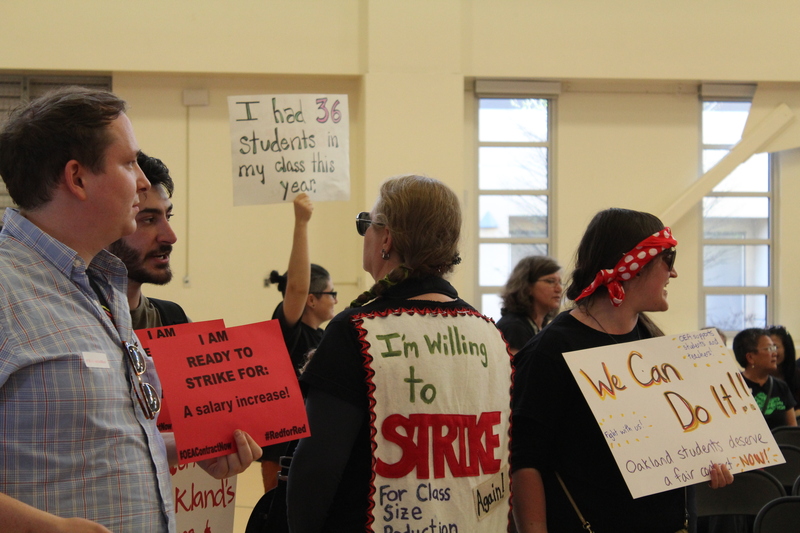 The future for Oakland public schools is that the public schools may survive as a tiny minority of publicly funded schools in a district with mainly privately managed charter schools occupying most of Oakland’s former public schools. So what? Well, unless the KIPPs the Aspire or Education for Change charter management organizations absorb the independent charters and approach being a monopoly structure of yesterday’s public school monopoly, their business plan won’t in the long run make payroll. Prior to charters, Oakland Public School system could save based on its bigness providing economic opportunities for savings. Closing 24 public schools makes Oakland a majority charter school district and reduces parental choice because for some parents their only choice will be privately managed charters, as publicly funded public school won’t be within walking distance for parents without transportation. Success of charter school growth reduces parental choice until the choice is like in New Orleans, leave the District if you want a public school option. Oakland public schools has been segregated by class and race due to government policies over 60 years of government financing of redlining and segregated housing. Segregated housing results in segregated schooling by class and race. Look at enrollment by class with most Oakland schools having 70% or more of Oakland school enrollment on free or reduced lunch. Free/reduced lunch is Federal statistic of poverty. Privatizing by privately managed charters has increased the already segregation of OUSD; and charter school “parental choice” has made segregation worse. OUSD School Board granted one charter for creating a African-French speaking school. There was the scandal associated with principal of a charter school leaving the country charged with misappropriation of school funding; the former principal responding from afar that the school was being run by male Turk followers of the imam Gulen who were draining money from the school. The Oakland Charter School Office without the capacity to detect the misuse of taxpayers’ education dollars never uncovered this scandal and it came to light in the media. The OUSD Charter School Office in 5 years will have even less oversight capacity with the fall outfrom the decision to close schools. As there is little sign that the Oakland School Board will stop renewing charter schools. The charter school that wants renewal puts lot of political pressure on the Board. Approval of new charters has slowed but one study found Oakland lost $57 million last year. 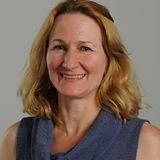 The District’s Charter Office goes through an analysis of strength and weaknesses of charter renewal and usually recommends the charter be renewed. This is despite low test scores and the deal about charters they supposedly are to be judged by test score improvement for all groups enrolled. Final problem for the Oakland School Board is that it has a new policy of looking at public and privately managed charters as one unit. This approach flies in the face of California charter law that says charter are to be independent of its creator. And, at the heart of the Board’s lack of power is that few realize that under the law the Board has no control over where charters set up their schools. This fact makes long-term planning near impossible. 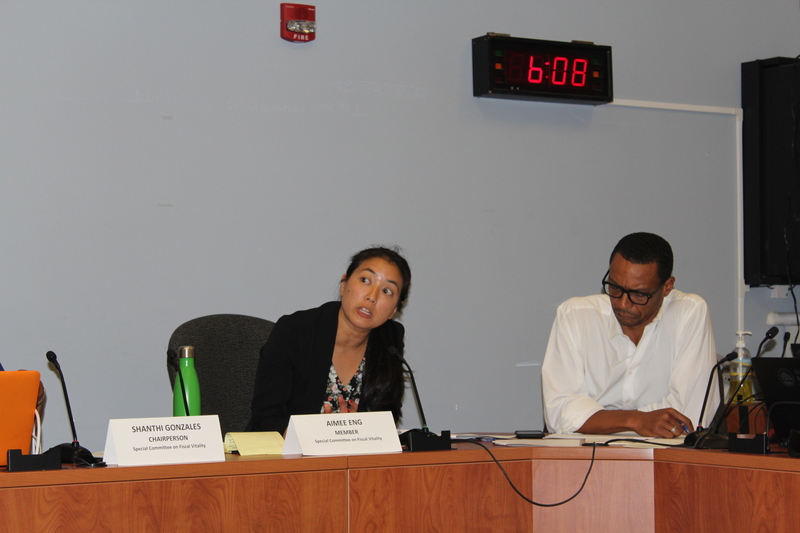 The Board could gain some control over the location of charter schools if it worked with the City of Oakland’s zoning power but it has in its planning so far ignored lack of Board power of charter location within Oakland. Oakland School Board recognizes the City has too many schools but some Board members do not recognize closing schools feeds the appetite of privately manage charters to occupy its public schools. In fact, Prop 39 gives a responsibility to school board to provide space for charters yet the charters cannot force school boards to spend a dime on housing charters. What this crazy Prop 39 has forced on school districts is co-location, that is the same school housing public and privately managed charter students. Having to share facility causes conflict between the public group and the privately managed group disruption and a problem that never existed before. Courts will decide in the future if declining enrollment requires a school district to move students around to provide for privately manage charters contiguous separate school for the charters. The irony of charter school experiment in California is the law was written to break the “monopoly” public schools had on the education dollar. But, it looks like economic efficiencies of monopoly is pushing charter schools toward monopoly but instead of traditional public schools monopoly, monopoly of privately managed big-time charter management organizations with economic and political bigness the backbone of their structure. At a time of deficit-spending and a Sacramento bail-out, the “Fiscal Vitality” committee made recommendations to increase teacher pay and the board adopted them? That’s fiscally irresponsible and just means deeper cuts to student programs and services, not just from the increase salary costs but also the commensurate increase in pension payments as well. Besides, cutting positions due to reductions in programs and services doesn’t sound like retaining teachers and sure isn’t a marketing point to help recruit new teachers (who will be on the bottom rung for the next round of lay-offs). Alameda County’s COL (cost of living) is 120% of the state average. Yet LCFF funding is uniform statewide. A student in Los Angeles (98% of the statewide COL), Sacramento (88%) or Fresno (79%) gets much greater local purchasing power for his educational buck. Since Oakland can’t order teachers, aides or custodians on Amazon, Oakland’s children get just 82¢ on the dollar compared with LA kids — 73¢ compared with Sacramento’s — and 66¢ compared with Fresno’s. On top of that, Alameda County taxpayers are net income tax contributors to statewide school funding, while all those other counties’ residents are net takers. So why do we talk about “bailout funding” for Oakland Unified? To make their LCFF purchasing power equivalent to the state average, they’d be getting $80M a year more. Does Oakland need to make $30M of cuts due to bad management? Or a badly tilted playing field? I hope Gary will use his elder wisdom to fight for equitable funding, not just equitable cuts. Great point, Jennifer. National regional cost differences are routinely used by many in California to reduce CA’s national ranking in per pupil funding and explain why CA needs to invest more in education. Yet few acknowledge the regional cost differences within the state and lobby for more equity in LCFF funding. It is time to fix this in-state imbalance in purchasing power. It will certainly be interesting to see how Oakland works their way through this – perhaps a model (or cautionary tale) for other districts that are now facing similar problems. “Reduce central office staff.” OK, that should result in cost reductions, but $30M? Hard to imagine. “Redesign the district by eliminating programs and initiatives that aren’t helping students” – another thing that will reduce cost, but significantly? Hard to say. “Reduce the number of district schools.” – that could certainly have impact – and perhaps enough to save $30M – but only if the reduction in number of schools results in layoffs of the “un-needed” staff. “Increase teachers’ pay.” – and how is that going to help their financial position? Given that teacher pay is the largest chunk of cost by far, increasing it – even a little – is likely to negate savings anywhere else … It may be a good thing, but it’s going to make the fiscal juggling harder, perhaps much harder. “Consult with constituents before making final decisions.” Yup. Right. We’ll see ….